This week - The suicide of TV's original Superman, George Reeves, in 1959 (Hollywoodland) and Tenacious D go on a quest to find a plectrum made from Satan's tooth, (Tenacious D in the Pick of Destiny). Poor Ben Affleck: part hunk, part chump. They say star quality means having something missing, not something extra: a void into which the yearning public can project their own hopes and dreams. With Ben Affleck, the something not-missing has always looked interestingly like irony, self-awareness, an educated personality ... Affleck has made some awful choices in his professional life ... Could this movie, for which Affleck won the best actor award at this year's Venice film festival, turn his career around? The scene is set. A suspenseful review. All the reviews have nothing but positive words for Affleck's performance. Bradshaw calls it "a clever, self-aware piece of casting and also that "Affleck gives the performance of his career, no question about it". I can’t believe I’m saying this, but the actor is alert and sensitive to every twist of a plot that requires him to die in three different ways. But Affleck’s fake Bostonian party accent and needy self-belief ring terribly true. 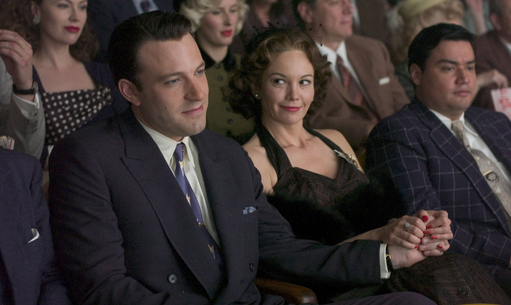 However, for Bradshaw"Affleck is pretty much the only interesting thing in a needlessly muddled and drawn-out movie." The film ends up "tangled up in uninteresting and unresolved conspiracy theories" and Affleck gets "shoved to the margins of his own movie" and is "upstaged by the dull figure of Brody"
He concludes that "there is something embarrassing and ironic in the very fact that Affleck is demoted from a proper starring role in the best film of his professional life." So what does Johnny Vaughan think? Well he gives it three bulldogs out of five although it is entirely possible that Vaughan (or someone) could have written this review without having seen the film. Amazingly, square-jawed Hollywood has-been Ben Affleck goes from zero to hero in this compelling true-life tale about the suspicious suicide of George Reeves, telly’s original Man Of Steel. For Johnny, Hollywoodland "is not a classic" but it still delivers a host of dazzling performances from a top-notch cast. For example "British bulldog Bob Hoskins is blinding" and "Adrien Brody continues his impressive run of form"
What? An impressive run of form? Brody hasn't made a decent film since 2002's The Pianist! Bradshaw gives it a hearty 1/5. Is it really that bad Peter? It's a pointless, mind-numbing experience. Ah ok. Wendy? Oh not you as well... 1/5. If you think the job of a film critic is easy, try sitting through this week’s releases and feeling your brain cells atrophy one by one. Ide encounters the same problems as Bradshaw, a lack of "jokes and the likeable characters". She'd "be very surprised if anyone outside the US gave a Gibson flying V for Tenacious D — and they certainly won’t after watching this film." So it's not so good then? Oh hang on, the Sun gives it a whopping four bulldogs out of five! Wild-Eyed Jack Black delivers awesome air guitar action in this hilarious heavy metal homage ... It’s Spinal Tap meets Cheech And Chong — a mix of pothead humour and high voltage heavy metal that may make your ears bleed but will definitely have you rolling in the aisles. Two words sum up this movie . . . IT ROCKS. Other films out this week - Leonard Cohen: I'm Your Man (A record of a January 2005 tribute concert to the poet and singer-songwriter in Sydney, with performances and interviews with him and such stars as U2, Nick Cave, Rufus and Martha Wainwright and Jarvis Cocker. ), Rampage (A portrait of hip-hop today, seen through the eyes of two rapping brothers. ), Something New (A corporate lawyer agrees to go on a blind date with a free-spirited landscape architect. ), The Santa Clause 3: The Escape Clause (Santa tries to stop Jack Frost from taking over Christmas.) Some great quotes from Bradshaw about this one - "Santa's traditional cry of ho-ho-ho has never sounded more like three stab wounds of pain and horror."... "Tim Allen's grinning face could appear in a dictionary next to the phrase 'menopausal self-loathing'"
Trailer of the week - Evan Almighty the sequel to the utterly rubbish Bruce Almighty BUT this one has Steve Carell.